"Keeping the Northern Palm Beaches Cool for over 15 years." 24/7 We're Here For You! 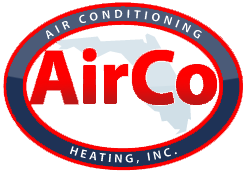 The technicians at AirCo Air Conditioning & Heating are fully qualified to provide all Jupiter Air Conditioning Services needed by homeowners and business owners. We have small town values yet deliver the highest quality maintenance, repair, and installation services. It’s uncomfortable in Florida when an AC system isn’t operating correctly or isn’t functioning at all, and that’s why we’re available 24/7. Our expert technicians are dedicated to customer satisfaction; and they provide professional AC services efficiently, with long-lasting results. 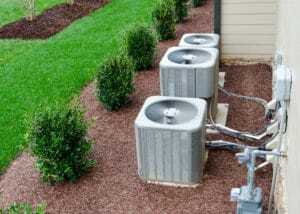 Your air conditioner seems to take longer and longer to cool your house down. Of course, regularly changing out dirty air filters helps to keep the system running more efficiently. Other potential issues include loose ducts that allow air to escape, air leaks, inadequate insulation, and air flow problems. If your air conditioner is running but isn’t cooling at all, it could be because ice has formed on the coils. This can also be the cause of a leak, once the ice starts melting. If you keep hearing a rattling or buzzing noise from your air conditioner, there are a number of possible causes. A part may have come loose, your motor could be headed toward the end of its useful lifespan, the stabilizing components of the air conditioner may have become unbalanced and worn, or the compressor may need repair or replacement. You could hear noise coming from your ductwork. Metal heating and cooling ducts can be quite noisy. Popping or pinging sounds coming from your ducts could be caused by thermal expansion or air hitting a loose flap of metal. Another common problem with an air conditioner is that it won’t turn off when it is supposed to – it simply continues running and running. This could cause a steep spike in your electricity costs, if the situation continues. The quickest way to shut off the AC is by shutting of the power at the circuit breaker. This should not be considered a permanent solution because circuit breakers aren’t meant to be used as on/off switches for appliances. You will enjoy lower energy costs with an air conditioning maintenance program, since it means that our technicians will keep your system working at peak efficiency. You will lengthen the life span of your AC system. A truly cost-saving benefit of an AC maintenance program with AirCo is that you minimize the possibility of needing costly and inconvenient emergency repairs. When all of the counterparts of an HVAC system are expertly maintained, you don’t unnecessarily put added strain on the environment. There will be improved indoor air quality (IAQ) in your home, due to routine upkeep of your AC system. 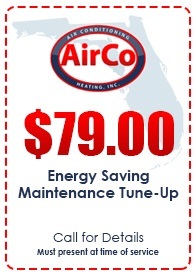 Contact us at AirCo today for the best in Jupiter air conditioning services.